Report for week ending September 23, 2016. 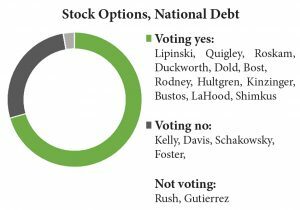 Stock Options, National Debt: Voting 287 for 124 against, the House on Sept. 22 passed a GOP-sponsored bill (HR 5719) that would allow employees to defer for as long as seven years the payment of income taxes on compensation received in the form of stock options. The bill would add $1 billion to federal debt over 10 years because it is not offset by spending cuts or revenue increases. Under existing law, stock options become a “taxable event” when they are fully conveyed to the employee, or vested. The bill applies to employees of companies at which at least 80 percent of the workforce receives stock compensation; it does not apply to management’s stock options. Censure Of Payments To Iran:united Made in publicly disclosed installments of $400 million and $1.3 billion, the payments would settle a dispute over arms transactions with the former shah of Iran. The first payment, for $400 million, was made on Jan.16, the date on which the nuclear deal took effect and the U.S. and Iran completed a prisoner swap. 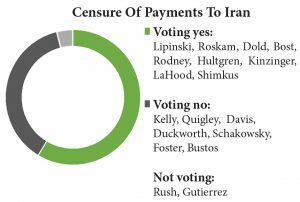 Republicans call that payment “ransom.” This bill imposes conditions on any future payments to settle Iranian claims, including a requirement that Congress be notified in advance. 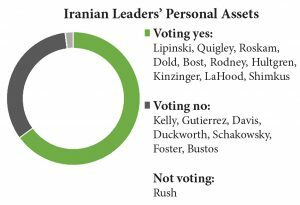 Iranian Leaders’ Personal Assets: Voting 282 for and 143 against, the House on Sept. 21 passed a GOP-sponsored bill (HR 5461) that would require the Department of the Treasury to provide Congress with classified information on the financial assets held by Iran’s top military and political leaders, including information on how they acquired their wealth. Collected by Treasury’s Office of Foreign Asset Control and Office of Intelligence and Analysis, this information is now classified and protected from circulation on Capitol Hill. A yes vote was to send the bill to the Senate, where it appeared certain to fail. 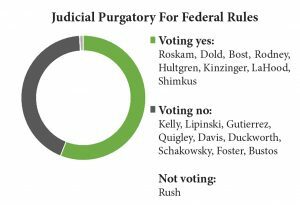 Judicial Purgatory For Federal Rules: Voting 244 for and 180 against, the House on Sept. 21 passed a bill (HR 3438) that would allow courts to indefinitely delay new federal rules that would impose a cost of $1 billion or more annually on the economy. If a petition seeking judicial review is filed within 60 days of the rule’s effective date, courts could stay the rule until the legal challenge is resolved, even if that takes years. Agencies have proposed about two dozen billion-dollar rules since 2006. In defining the term $1 billion, the bill counts compliance costs but not the savings to society that result from factors such as improved job safety and environmental protection. Exempting Rules For Homeland Security: Voting 182 for and 240 against, the House on Sept. 21 defeated a Democratic bid to keep HR 3438 (above) from indefinitely delaying rules that would protect the country against domestic and foreign security threats. 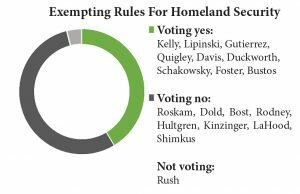 A yes vote was to exempt homeland-security rules from the underlying bill. Exempting Rules On Medical Costs: Voting 189 for and 232 against, the House on Sept. 21 refused to exclude from the scope of HR 3438 (above) any proposed federal rule designed to reduce the cost of health care for persons 65 and older. 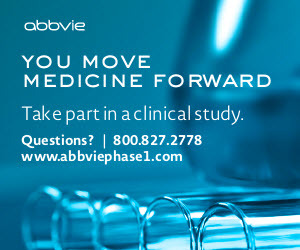 A yes vote was to exempt rules that cut seniors’ medical costs from the bill. $1 Billion In Arms To Saudi Arabia: By a vote of 71 for and 27 against, the Senate on Sept. 21 tabled (killed) a measure (SJ Res 39) that sought to block a proposed $1.15 billion U.S. arms sale to Saudi Arabia. In the deal, the Saudis would receive153 Abrams tanks, 20 Hercules armored vehicles and smaller arms such as of machine guns and smoke-grenade launchers. Critics said the deal would further entangle the U.S. in Yemen’s civil war, which Saudi forces have joined. A yes vote was to approve the U.S.-Saudi weapons deal.